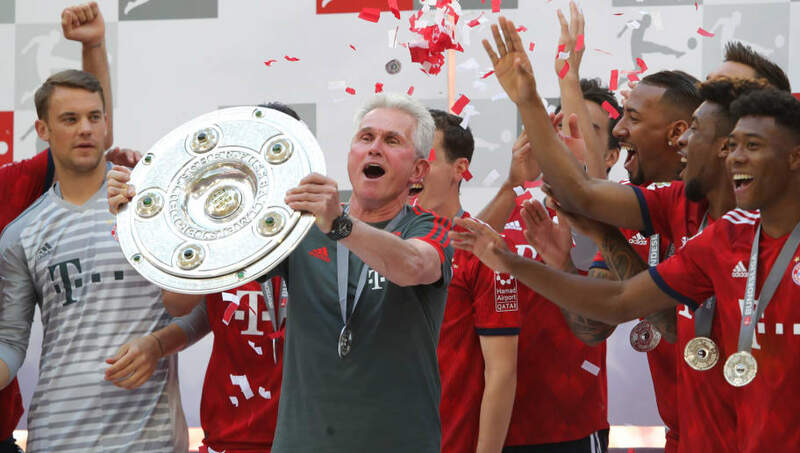 Jupp Heynckes has promised fans that they will see a "different" Bayern Munich performance in the DFB-Pokal final next week following their disappointing defeat to VfB Stuttgart on the final day of the season. The veteran manager was in charge for one final time at the Allianz Arena as the Bavarians suffered a 4-1 defeat to the Europa League-chasing Swabians. And despite losing his final home game before the end of the season, Heynckes heaped praise onto the resilient Stuttgart, whilst also vowing that ​Bayern Munich would have a turnaround in Berlin next week. "Congratulations to VfB Stuttgart! They turned in a top display with many counters and deservedly won at the end of the day," Heynckes told the club's official website. "VfB were very well-organised, they were great in defence. We had three gilt-edged chances when it was 1-1, we failed to take them. If you're up against a top-class defence you have to take the lead so your opponents have to change their tactics. "It was one of those days. Now we have to accept and stomach the defeat and prepare for the cup final as best we can from Tuesday. We'll see a different Bayern team in Berlin." Stuttgart's win at the Allianz Arena has seen the Swabians sneak into seventh place in the ​Bundesliga table - offering Tayfun Korkut's side a chance a European football next season, but only if Bayern Munich beat Frankfurt in next week's cup final.